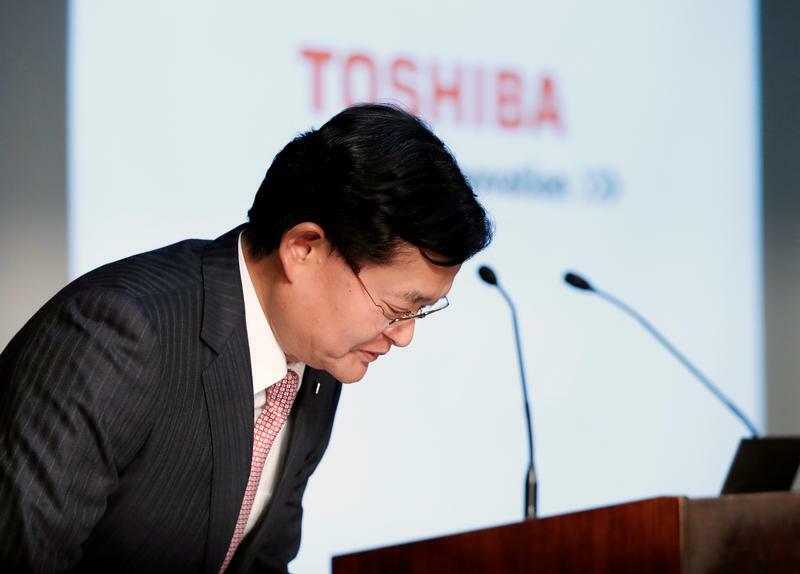 Toshiba Corp's CEO Nobuaki Kurumatani bows during a news conference at the company's headquarters in Tokyo, Japan May 15, 2018. Japan’s Toshiba on Feb. 13 cut its forecast for operating income in the fiscal year ending in March by 67 percent to 20 billion yen ($180 million). It attributed the revision in part to a fall in the price of subsidiary NuFlare Technology's stock, as well as continued operating losses from energy systems and storage divisions. The company also reported a 5 percent decline in net sales to 2.6 trillion yen in the nine months ending in December compared to the same period in 2017. Operating income fell by over 47 billion yen to 8.2 billion yen, mostly due to sharp declines in the energy systems division and storage and electronic devices. Free cash flow rose by 1.8 trillion yen to 1.4 trillion yen.